Stunning mountain and sea views from a cozy house on the Ring of Kerry. 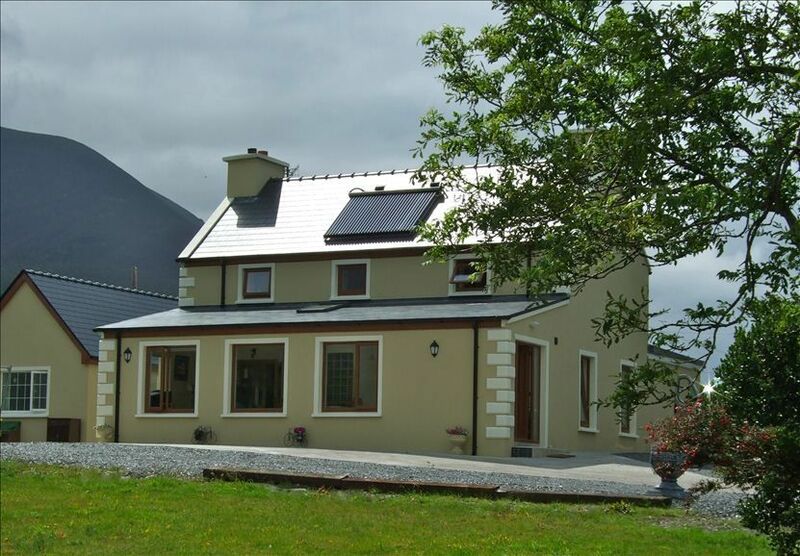 'Teach Cuas Gorm' is a beautful renovated farmhouse minutes off the main Ring of Kerry route. This holiday home is situtated on an elevated 3/4 acre site, it offers breathtaking views of Dingle Bay and magnificant mountain views. Only a 3 minute walk from the beautiful blue flag beach in Kells Bay. A spacious garden provides a safe area for children to play and for the family to relax after touring the Ring of Kerry. Sleeping accommodation consists of two en suite bedrooms on the ground floor, one with a kingsize bed, the second with a double bed. On the first floor there is one double bedroom and one single bedroom. The first floor also has a bathroom with an 8 jet jacuzzi bath and a seperate shower. There is a fully equipped kitchen, a dining room and a sitting room with wood/ turf burning stove. The local shop, restaurant, pub, and petrol station are only a 10 minute drive away. More restaurants, craft shops, traditional irish pubs and entertainment are located in the nearby village of Glenbeigh (12 Kilometres) and the town of Caherciveen (10 Kilometres). This house is a 2 hour drive from Cork airport and a 3 hour drive from Shannon airport. Place was amazing. Beautiful views! Very well stocked with whatever you needed. Spacious house with beautiful views! We loved the house and Paddy was a delight! The girls enjoyed the sheep and the donkeys across the street and did I mention the views? It was so tranquil and drinking coffee outside in the morning looking out over the Atlantic was bliss. We went to Torc Falls and did a bit of Slea Head Drive and stopped in at Inch Beach. I would highly recommend this house to everyone! Wonderful location, pretty view, and close to Kell’s beach. Bridie and Patrick were very helpful. Putting money into the furnance to keep the heat going was a little strange, but overall I would highly recommend! The house was large, spacious, and definitely easy to heat as others have said. The area surrounding the house was GORGEOUS! However, I would like to offer a word of advice - Make sure you allow more than enough time to drive the Irish roads and make it to this place before dark. We allowed a lot of time, but not near enough and ended up trying to locate this place in the dark... This is in a Dark Sky reserve, so not only are the roads difficult to manage (small, opposite side of the road for Americans, the usual), but it is VERY dark after the sun goes down (no street lights, reflectors on the road, etc.) and it will be very hard to find the house. Not only that, but you will miss seeing the beautiful area you are staying in! But that was a lovely sight to wake up to! We also traveling during non-peak season, so many of the local places were closed by 8pm. However, the Gardens right down the street have delicious Thai food! :) We traveled to Cork from here, which was a lovely drive. We also drove the Ring of Kerry, which was just breathtaking. We loved the sitting room and the fireplace, and were very comfortable in our rooms. The house is minutes from a lovely beach, which gave us an amazing sunset and some of the best photos of our trip. Overall, it was a lovely stay in the Ring of Kerry. A lovely comfortable house in a fantastic location. This house is spacious and comfortable and boasts the most amazing views. Whether you go up the hill or down the hill from the house your are surrounded by mountains, sea, flora and fauna...and there are donkeys across the road! The owner is kind and helpful and full of local knowledge. We will be back many times, I hope. Family long weekend holiday. Just perfect! House is much better than what it looks from the photos. Location is just perfect if you rather have spectacular views when you wake up in the morning than being at the heart of some town. Everything you can possibly need for an amazing Ring of Kerry experience is included in this house, including the owner's helpful and lovelyness, maps for treks, TV for a quiet evening and a warm comfortable bed to rest after hours of hiking. House is super warm and cosy. I just got back home but can't wait to go back there.